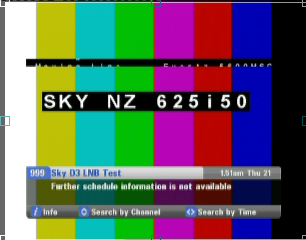 I was channel surfing through Sky when I came across Channels 998 (LNB Test) and 999 (Sky D3 LNB Test). Channel 998 pulls up the rainfade message but 999 has a test pattern with "Sky NZ 625i 50" and a scrolling bar with the message "Moving Line Evertz 5600MSC". If they start using D3 then I can see a lot of installer visits happening. I was lucky when we got MySkyHDi that we had the Quad LNB installed and 2 coax cables run from it to the sky box (to allow multi satellite recording) but as I understand this stopped happening and they just install a Quad LNB with single coax. Also I'm guessing there are still people out there with single LNBs still. Yup I expect that too. Although if there is a simple wholsale shift on to D3 from D2 then it simply requires a decoder configuration change as I think the LNB can pick up D3 from where it is pointing, but if they're spanning the two satellites then yes they'd need to dual cable everyone again. 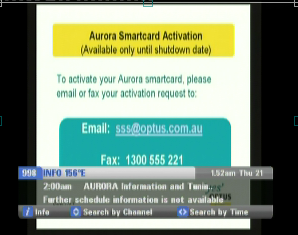 The aurora smartcard test has been there for ages now. One can always still have hope to more channels with a higher quality picture. Do you have some inside knowledge? I believe Sky are under some pressure to provide more channels in HD. I wouldnt say its "some pressure" - i think Sky's subscribers are screaming out for more HD Content!!! Its not as if the content Sky NZ buy in and show ISNT in HD anyway??!! Oblivian: The aurora smartcard test has been there for ages now. Did you manage to get them FTA? DickDastardly: I wouldnt say its "some pressure" - i think Sky's subscribers are screaming out for more HD Content!!! Its not as if the content Sky NZ buy in and show ISNT in HD anyway??!! Apart from TV1,2,3, Sky only offer Sky Sport 1..4, SoHo, and a couple of Sky Movies channels in HD. Every other channel is broadcast in SD and very poor quality when watching on a 55" large screen TV. Shows that I have watched in HD such as Modern Family on TV3, I can't stand watching on The Box. We just wait until the series is on TV3 a few months later. Antec Veris Fusion v2 Case, Gigabyte 880GM-USB3, Nvidia GT-730, AMD FX 6100 6-core 3.3Ghz, Blackgold BTG3600, Hauppauge HVR-2200, Logitech Harmony 525 remote, Windows 10 (32-bit), Mediaportal. If it was on the 'Box' channel on SKY then it would have been on TV3 before it was on the 'Box'. Except for series where TV3 start showing it but stop as no one is watching it ie CSI NY but don't think that happened with Modern Family. Totally agree - the HD selction in NZ (esp. when compaired to other territories) is rubbish! Obvious candidates for the HD upgrate treatment are Discovery, History, Prime (there was even a whinge on Stuff about Prime NOT being in HD when it launched its new season of shows - ALL will look substandard when viewed in SD) Living, UK TV, Nat Geo etc. The content shown on all these channels is 99.9% HD already - so it comes back to that age old arguement from Shy NZ about lack of capacity and network capabilities etc - How can NZ and OZ have such a different levels of HD content - yes we are on different satellites - but we shouldnt be - its no excuse really! Get Sky NZ onto Optus D3 now!! Does anybody know how much capacity is actually available in the 156E position (C1/D3)? I wouldn't have thought there is much if any... and that Foxtel would have dibs on anything that is available. Maybe this is wishful thinking, but I reckon it would be nice if there would be a bit of shuffling when Aurora is switched off and Optus 10 is [finally] launched. Sky could have Optus 10 to themselves leaving D1 for Freeview, SBS, ABC and Vast, and the movement of Vast frees up more space on C1/D3 for Foxtel. Everyone is happy. Another question: does anybody know why SBS and ABC have their transmissions on D1? Will they go away when Aurora goes away and Vast becomes the only satellite solution for TV in remote areas of Australia?